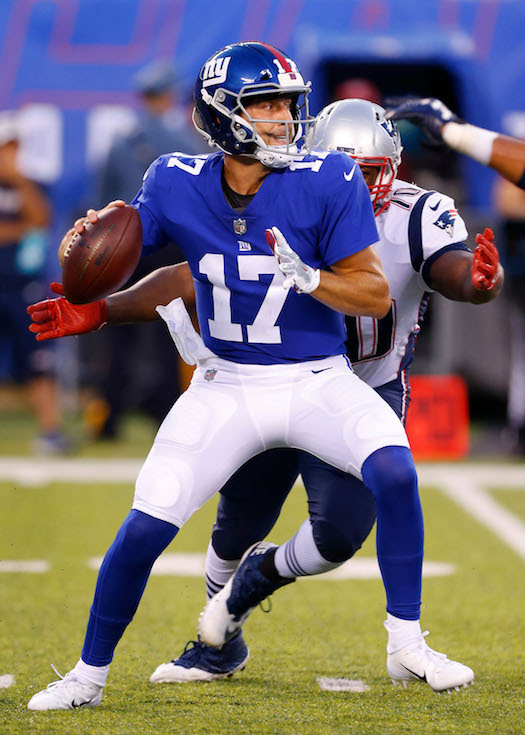 The New York Giants preseason ended on Thursday night with a 17-12 loss to the New England Patriots at MetLife Stadium in East Rutherford, New Jersey. The game was a boring, glorified scrimmage for back-ups. None of the Giants starters played and Head Coach Pat Shurmur oddly decided not to play second-string quarterback Davis Webb, with Kyle Lauletta getting the start. Even place kicker Aldrick Rosas sat on the bench all night. Both teams punted twice to start the game. The only play of note being a sack by linebacker Lorenzo Carter on 3rd-and-9 to end the Patriots’ second drive. Aided by two of the new 15-yard, lowering-the-head-to-initiate-contact penalties, the Patriots set up a successful 33-yard field goal on their third drive. The Patriots got the ball back immediately as Lauletta’s deep pass intended for wideout Kalif Raymond was intercepted at the Patriots’ 18-yard line. After a three-and-out by New England, the Giants went ahead early in the 2nd quarter as wide receiver Amba Etta-Tawo turned a short pass reception from Lauletta into a 41-yard touchdown sprint. Place kicker Marshall Koehn missed the extra point and the Giants led 6-3. A subsequent New England threat was stopped by a spectacular, diving interception by cornerback Donte Deayon at the Giants’ 6-yard line. After two New York punts and another by New England, Deayon picked off his second pass, this one over the middle, right before halftime. Lauletta was picked off on the third offensive play of the 3rd quarter on a deep pass intended for wide receiver Roger Lewis, Jr. at the 42-yard line. Six plays later, the Patriots went up 10-6 on quarterback Danny Etling’s 1-yard touchdown pass after a 45-yard deep strike set up the score. Both teams punted twice after that. The next scoring threat came from the Giants in the 4th quarter as New York drove from their own 1-yard line to the Patriots’ 14. But on 4th-and-6, fourth-string quarterback Alex Tanney’s pass fell incomplete. The game then got comical as Etling scored from 86 yards out on a quarterback bootleg run with none of the Giants’ defenders playing contain. The Giants scored a touchdown with less than a minute left to play to make the score look more respectable, as Tanney hit wide receiver Alonzo Russell from eight yards out. Lauletta finished the game 8-of-19 for 118 yards, one touchdown, and two interceptions. Other than Etta-Tawo’s one catch for 41 yards, no one had more than 30 yards receiving for the Giants in the game. The leading runners for New York were Jalen Simmons (11 carries for 41 yards) and Jhurell Pressley (7 carries for 40 yards). Defensively, Deayon had two interceptions and four pass defenses. Cornerback Chris Lewis-Harris was credited with six tackles and two pass defenses. Carter had one sack and nose tackle Robert Thomas the other. Not playing for the Giants due to injury were tight end Evan Engram (concussion), linebacker Olivier Vernon (ankle), linebacker Connor Barwin (knee), offensive guard Nick Gates (foot), defensive end R.J. McIntosh (unknown), and safety Darian Thompson (hamstring). Offensive tackle Nick Becton (ankle) and running back Robert Martin (ankle) left the game with injuries and did not return. Linebacker Avery Moss (knee) left the game, but later returned. Healthy scratches included place kicker Aldrick Rosas, quarterback Davis Webb, quarterback Eli Manning, wide receiver Cody Latimer, wide receiver Odell Beckham, cornerback Janoris Jenkins, safety Landon Collins, cornerback Eli Apple, running back Saquon Barkley, running back Jonathan Stewart , safety Curtis Riley, cornerback B.W. Webb, linebacker Warren Long, linebacker Alec Ogletree, guard Patrick Omameh, guard Will Hernandez, defensive end Kerry Wynn, tackle Ereck Flowers, center Jon Halapio, tackle Nate Solder, tight end Rhett Ellison, wide receiver Sterling Shepard, linebacker B.J. Goodson, defensive end Dalvin Tomlinson, defensive end B.J. Hill, linebacker Kareem Martin, and nose tackle Damon Harrison. Teams must cut their rosters to 53 players by 4:00PM ET on Saturday.